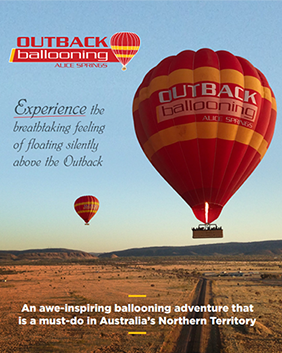 Outback Ballooning is a locally owned and operated business that has been operating hot air balloon flights in Alice Springs since 1986. We are one of Australia’s longest established ballooning companies and the only one specialising in remote Outback operations. We operate every day except Christmas Day, Boxing Day and New Year’s Day, weather permitting. Outback Ballooning has a large fleet of balloons suitable for 2-4 people, up to 8, 12, 16, 20 and 24 people in one balloon depending on the number of bookings on the day. The reliable desert weather means we have one of the lowest cancellation rates in the world, flying 250-300 days per year. Our pilots are very experienced with a wealth of local knowledge to share with the passengers. Apart from flying in this amazing desert landscape, some have even flown around the world in places like Canada, Africa and New Zealand. Our ground crew are fully trained in all things ballooning and are required to attend mandatory safety training on a regular basis to ensure the safety of our passengers is their main priority. Our capacity allows us to cater for FIT, group travel, incentives, special interest and private charter markets. As we increase capacity simply by flying more balloons everyone receives personal attention no matter how many or few people are flying on the day. Exclusive charters are also available on request. Charters are perfect for honeymooners looking for that unique romantic experience! The Australian Tourism Accreditation Program ensures that tour companies, inbound operators, wholesalers and retail agents may book with us with confidence. Passengers can be assured that we are committed to providing a safe high quality product. Outback Ballooning is also a member of the Australian Tourism Export Council (ATEC), a peak industry body representing Australia’s $43 billion tourism export sector. Being a member provides us with opportunities to connect our product with international distribution channels and connect our services with other suppliers in the Tourism industry. It also provides assurance to the industry that we are export ready and understand the international market requirements. ATEC membership is also the key to recognition as an International Ready operator.